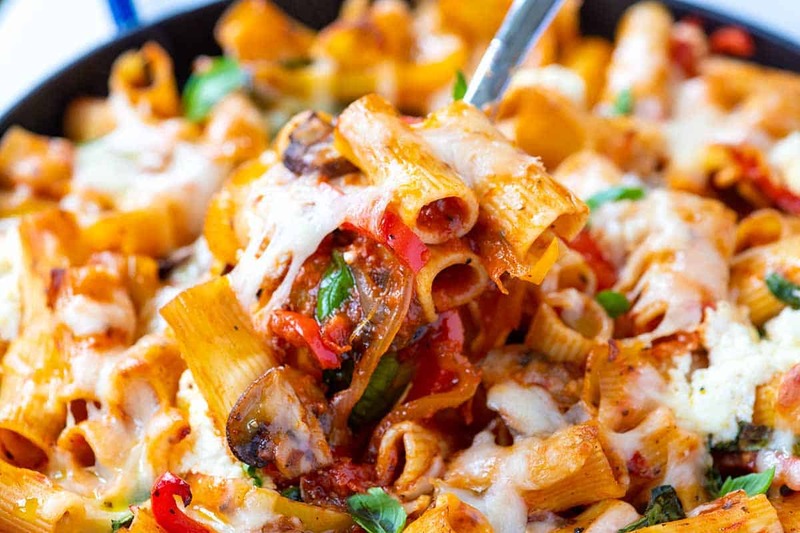 This easy baked pasta is loaded with vegetables, extra cheesy, and seriously irresistible. Our meatless baked pasta will please vegetarians and meat lovers alike. 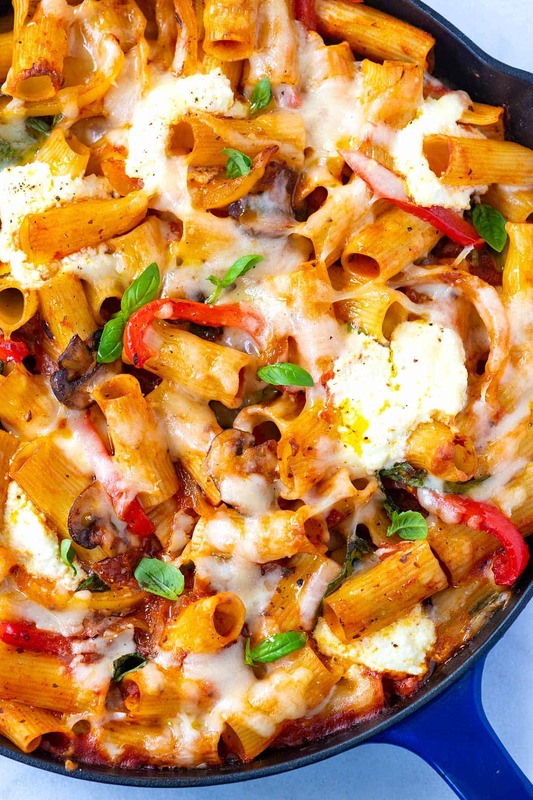 Jump to the Vegetable Baked Pasta Recipe or read on to see our tips for making it. The recipe calls for seasonal vegetables and affordable pantry ingredients. The pasta is hearty and ultra-satisfying. 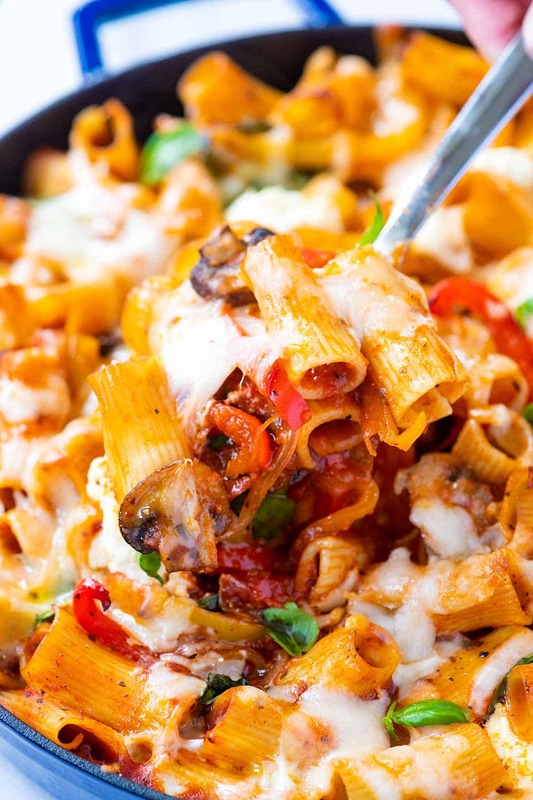 Even meat lovers adore this vegetarian baked pasta recipe. Baked pasta is the perfect make-ahead meal. Look for all my tips below. 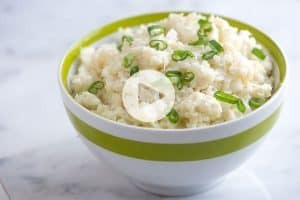 It’s incredibly easy to make and can be adapted to be dairy-free/vegan (I’ve shared substitutions below). A few years ago, we shared our recipe for vegetable lasagna. So many of you have commented about how much you love the recipe, we set out to create another veggie based pasta, but one that doesn’t require nearly as much time to make. Pasta of choice — I love rigatoni, which is what we used in the photos. Vegetables — These are up to you. 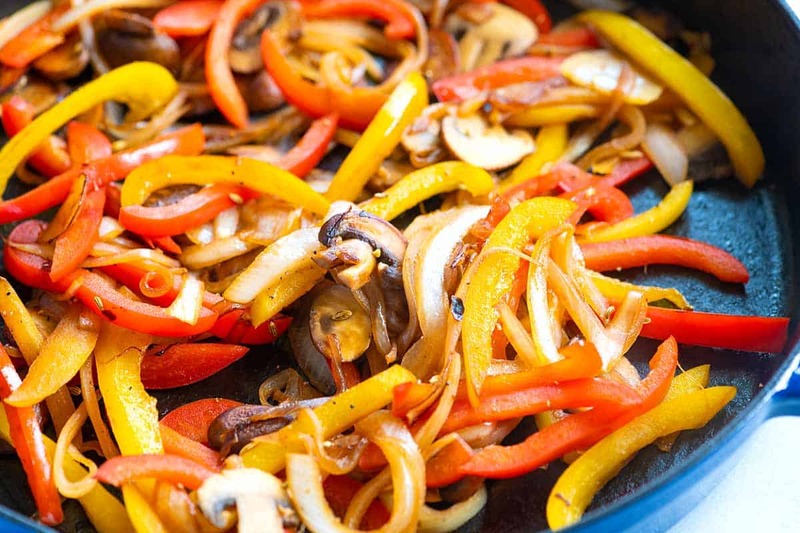 In our photos, we used onion, bell peppers, and mushrooms. I’ve shared alternatives below. Marinara sauce — The sauce you use can be homemade — here’s our recipe — or you can use store-bought. I love Rao’s and Muir Glen sauces. Fennel and fresh basil — A simple addition of spice and fresh herbs are what makes this pasta taste homemade and fresh. Ricotta and mozzarella cheese — The ricotta turns into pockets of creamy heaven and the mozzarella becomes melty and brown. I start by partially cooking my vegetables in a skillet on the stove. I use the largest oven-safe skillet in my kitchen so that it can double as the baking dish that goes into the oven. Cook sliced onions, bell peppers, and mushrooms on the stove-top. While the vegetables cook, bring a pot of water to a boil and cook the pasta. Combine the vegetables, pasta, fresh basil, and marinara sauce. Sneak spoonfuls of creamy ricotta cheese into the pasta and vegetables. Add shredded cheese to the top and bake until bubbly. If you have one large enough, cook the vegetables in an oven-safe skillet that can also be used as the baking dish. Cubed zucchini or summer squash. Spinach, kale, or collard greens. Winter squash like butternut or delicata squash — This will take a bit more time to cook. One of my favorite things about this pasta recipe is that it’s incredibly easy to adapt. It is already delicious before adding cheese so for a vegan variation, just leave the ricotta and mozzarella out. For a little extra “cheesy” flavor, I love stirring a tablespoon or two of nutritional yeast into the marinara sauce. 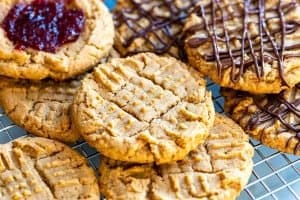 You could also experiment with adding vegan cheese alternatives. You can refrigerate the pasta unbaked. Cover and refrigerate the assembled, but unbaked pasta up to 2 days. When you cover, use parchment or wax paper between the pasta and aluminum foil. Aluminum foil can react with the tomatoes. Another vegetarian pasta, this Baked Ziti With Spinach and Artichokes is a fan favorite. No-boil lasagna sheets make our Healthier Spinach and Mushroom Lasagna extra easy! Vegetable baked pasta loaded with veggies, pockets of ricotta cheese, and topped with melty mozzarella. 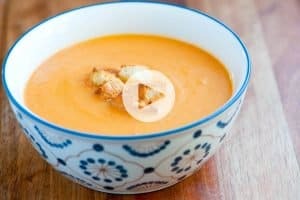 The vegetables you use can be adapted based on seasonality, check our article above for more suggestions. 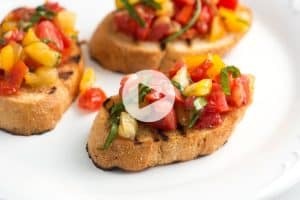 For a vegan variation, leave out the ricotta and mozzarella and instead stir a couple of tablespoons of nutritional yeast into the marinara sauce. Heat the oven to 350 degrees Fahrenheit. If you have an oven-safe 12-inch deep skillet, you can cook the veggies and bake the pasta in it. If you do not, prepare a 3-quart baking dish by lightly greasing with olive oil. Bring a large pot of salted water to a boil, and then cook the pasta. Check the package for cook time, but cook the pasta two minutes less than what is recommend on the box (it will continue to cook in the oven). Before draining the pasta, reserve 1/2 cup of the pasta water. While the pasta cooks, prepare the vegetables. Slice the onions and bell peppers into 1/4-inch thick slices. Heat a wide skillet over medium-high heat. Add the oil then add the mushrooms, in one layer, and cook until browned on one side, 3 to 5 minutes. Stir then add the onions and peppers. Cook another 3 to 5 minutes or until the veggies are starting to soften and have some browned edges. Season to taste with salt and black pepper (I usually add 1/4 teaspoon of each). Stir the fennel, marinara sauce, and basil into the vegetables. If your skillet is large enough, toss in the pasta and if the mixture seems dry, add a splash of the reserved pasta water. If the skillet is too small, combine the sauce and pasta in a bowl. Adjust with pasta water, and then add to a baking dish. Taste the pasta and adjust with more salt and pepper. Tuck spoonfuls of ricotta around the pasta, and then top with the mozzarella cheese. Bake the pasta, uncovered, until the cheese melts and is bubbling, 20 to 25 minutes. Fennel adds a light licorice flavor to the pasta and is one of the spices used to make Italian sausage. I use whole fennel seeds, but crack them open first to release the oils. To use it whole, crack the seeds slightly using the heel of a chef’s knife or the bottom of a frying pan. Quick question where does the fennel seeds or powder go? Does it go in the pasta water? Hi Tanya, We add the fennel at the same time as the marinara sauce. The instruction was left out of the recipe (sorry!). I just fixed it. Happy cooking!